Here is the latest installment in our weekly caption competition. If you’re part of our Facebook community then you’ve already had the heads up on this one. You may have noticed a name change though â€“ this competition, previously called ‘Name That Pic’ â€“ will from this day forward be known as ‘Caption This’ to reflect the name of a very cool new Facebook app that I have in the works. It’s not tricky â€“ post your caption idea in the comments section some time over the weekend and I’ll pick a couple of winners at my discretion. The aformentioned winners will be selected and announced on Monday (Down-Under). 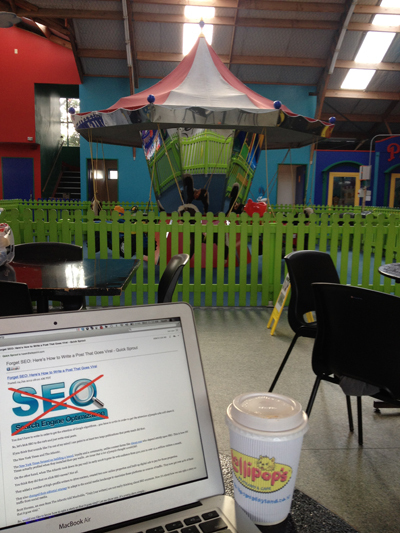 The winning entry from Facebook was “Livin’ the Australian office dream: a carousel, uncomfortable cafeteria chairs, an artfully placed Pinterest logo and a green picket fence.” You can see the rest of the entries here.Â The best two entries (in my opinion) will win themselves digital copies of The WordPress Anthology.